rowth and development of corn are strongly dependent on temperature. Corn develops faster when temperatures are warmer and more slowly when temperatures are cooler. For example, a string of warmer than normal days in late spring will encourage faster leaf development than normal. Another example is that a cooler than normal grain filling period will delay the calendar date of grain maturity. The phrases "string of warmer than normal days" and "cooler than normal grain filling period" can be converted mathematically into measures of thermal time by calculating the daily accumulations of heat using temperature data. Commonly used terms for thermal time are Growing Degree Days (GDDs), Growing Degree Units (GDUs), or heat units (HUs). Different methods exist for calculating heat units depending on a) the crop or biological organism of interest and b) the whim or personal preference of the researcher. The calculation method most commonly used throughout the U.S. for determining heat unit accumulation relative to corn phenology was first evaluated by Gilmore & Rogers (1958) and termed "Effective Degrees". Barger (1969) later proposed that the same method, which he termed "Modified Growing Degree Days", be adopted as the standard heat unit formula by the National Oceanic and Atmospheric Administration. This method calculates daily accumulation of GDDs as the average daily temperature (degrees F) minus 50. The "modification" refers to the limits imposed on the daily maximum and minimum temperatures allowed in the calculation. Daily maximums greater than 86 degrees F are set equal to 86 in the calculation of the daily average temperature. Similarly, daily minimums less than 50 degrees F are set equal to 50 in the calculation. If the daily maximum temperature was 80F and the minimum was 55F, the GDD accumulation for the day would be ((80 + 55) / 2) - 50 or 17.5 GDDs. If the daily maximum temperature was 90F and the minimum was 72F, the GDD accumulation for the day would be ((86 + 72) / 2) - 50 or 29 GDDs. If the daily maximum temperature was 68F and the minimum was 41F, the GDD accumulation for the day would be ((68 + 50) / 2) - 50 or 9 GDDs. In late April to early May, normal daily GDD accumulations for central Indiana are about 10 GDDs. By late July, the normal daily accumulation rises to about 23 GDDs. For a typical corn growing season in central Indiana, say from late April to late September, the total seasonal accumulation of GDDs is about 2800 GDDs. The USDA-funded Useful to Usable (U2U) multi-state research and Extension project developed a GDD decision support tool that is now hosted by the Midwestern Regional Climate Center at http://mrcc.isws.illinois.edu/U2U/gdd/. 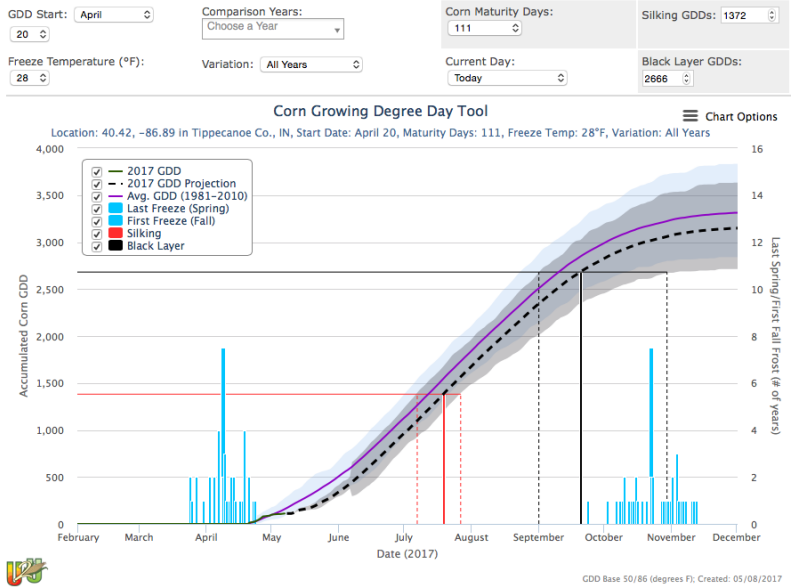 The GDD Tool estimates county-level GDD accumulations and corn development dates based on current and historical GDD data plus user selected start dates, relative hybrid maturity ratings, and freeze temperature threshold values. The GDD and corn development predictions are displayed graphically and in tabular form, plus the GDD accumulation estimates can be downloaded in a Comma Separated Value (.csv) format for you to work with in your own spreadsheet program. The GDD Tool is currently available for the states of North Dakota, South Dakota, Nebraska, Kansas, Minnesota, Iowa, Missouri, Wisconsin, Illinois, Michigan, Indiana, Ohio, Kentucky, and Tennessee. Figure 1 shows a screen capture from that calculator in which I selected "Tippecanoe Co., IN", a start date (aka planting date) of Apr 20, a relative hybrid maturity rating of 111 "days", and a freeze temperature threshold of 28F. The tool automatically adds estimated GDD values from planting to silking and black layer based on the "corn maturity days" you enter, but each is customizable if you know the GDD values specific to your hybrid. The tool displays estimates of actual cumulative GDD from planting to today's date, then estimates of cumulative GDD for the remainder of the season. Estimates of silking and black layer dates are displayed, as well as the early and late ranges of those estimates. When you are viewing the actual graph on the Web site, estimates of GDD accumulations at specific dates "pop up" when you hover your computer mouse over parts of the line graph. predicted corn development stages for a 111-day hybrid planted Apr 20 in Tippecanoe County, IN. Barger, G.L. 1969. Total Growing Degree Days. Weekly Weather & Crop Bulletin 56:18. U.S. Dept. of Commerce and USDA, Washington, D.C.
Gilmore, E.C. and J.S. Rogers. 1958. Heat units as a method of measuring maturity in corn. Agron. J. 50:611-615. Nielsen, RL (Bob). 2014. Determining Corn Leaf Stages. Corny News Network, Purdue Univ. [On-Line]. Available at http://www.kingcorn.org/news/timeless/VStageMethods.html. [URL accessed May 2017]. Nielsen, RL (Bob). 2014. Use Thermal Time to Predict Leaf Stage Development in Corn. Corny News Network, Purdue Univ. http://www.kingcorn.org/news/timeless/VStagePrediction.html. [URL accessed May 2017]. Nielsen, RL (Bob). 2017. Hybrid Maturities for Delayed Planting. Corny News Network, Purdue Univ. http://www.kingcorn.org/news/timeless/HybridMaturityDelayedPlant.html. [URL accessed May 2017]. U2U@MRCC. 2017. Corn GDD. Useful to Usable Project, Midwestern Regional Climate Center. http://mrcc.isws.illinois.edu/U2U/gdd/ [URL accessed May 2017].